Our Nordic Product Manager Sari Kaufmann travelled to see the Bárðarbunga eruption in September 2014 – and was lucky enough to travel with a videographer who shot the amazing footage in the video below. I have been to Iceland many times and seen some of the most amazing landscapes, but nothing prepared me for the 1.5 hour helicopter flight to Holuhraun. 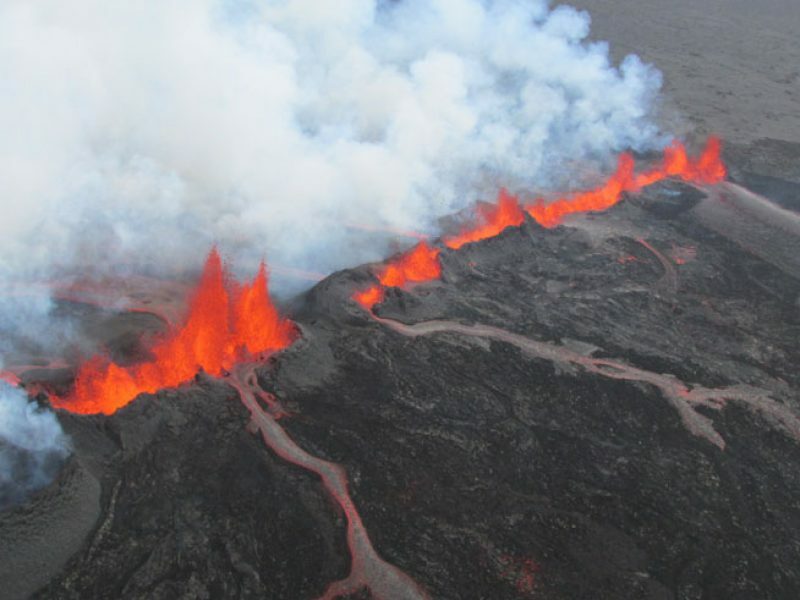 The ongoing Holuhraun fissure eruption is part of the Bárðarbunga system, and located just north of Europe’s largest glacier, Vatnajökull, in the remote and uninhabited part of Iceland’s north-east highlands. We flew on a helicopter flight-seeing trip to the site of the erupting volcano, taking off from Reykjavik Airport and flying over the colourful roofs of the city, but within minutes we were over Þingvellir National Park. This historic area, where Iceland’s first parliament (the Althing) sat, is the site of the Mid-Atlantic Ridge, where the Eurasian and North American tectonic plates are pulling apart and forming a large crack in the rock. Witnessing this from air gave the area a completely different and really interesting perspective. Our journey north-east followed the river Hvítá, with the famous waterfall Gullfoss – one third of the Golden Circle – looming further north. We then started crossing the highlands with Mt Hekla, another active volcano, to the east. For a while we followed the photogenic glacial river Þjórsá, with Hofsjökull glacier to the west. Our pilot, Reynir, was an excellent and knowledgeable guide; he took us low to point out places of interest and then gently flew us over mountains and glaciers, finally arriving at Holuhraun. I have seen many videos and photos of volcanic eruptions, but nothing beats the personal experience! Reynir flew to the side of the volcano so we got a great view of the magma shooting high up in the air and flowing out of the crater forming several channels of glowing orange magma rivers. We could not land due to security restrictions, but spent at least an hour flying around the volcano, making sure we got pictures from all angles. We also had time just to sit back and take in this amazing natural behaviour of our planet; to be honest I completely lost track of time. Don’t miss the chance to see this incredible volcanic eruption for yourself. We’re now well into the northern lights season, so there’s every possibility that you could witness two of nature’s most incredible spectacles on the same trip. We offer a selection of dedicated itineraries and excursions which can be booked separately and added to any of our Iceland fly-drive or tailor made holidays, subject to availability. Contact our team of Iceland Travel Specialists on 01737 214 250 or make an enquiry to receive a tailor made quotation.